It's About TV: Blogging on Me-TV. Oh, and it's Christmas in July, too! Blogging on Me-TV. Oh, and it's Christmas in July, too! As I've mentioned in the past, I'm a proud member of the Classic TV Blog Association, and from time to time we engage in a blogathon - a week of concerted blogging by members on a specific topic. 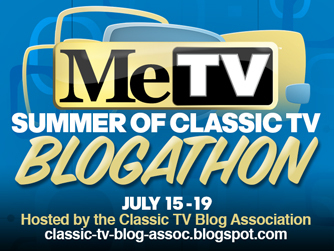 Our next one begins next week, July 15, and takes as its theme the classic programs being shown currently on Me-TV. Please do us all a favor - as well as yourself - and check out the blogathon. These are excellent blogs written by people who not only have a knowledge of classic TV, they also have a deep affection for it. You might already be familiar with many of these shows; on the other hand, you could be reading about them for the first time. In any event, look through the schedule below (and go to the CTBA website for updates), and enjoy! While we're on the subject, you might have noticed Joanna Wilson's Christmas TV History blogathon on the schedule for Monday, July 15 (with a Christmas episode of That Girl). This month, Joanna is also celebrating Christmas in July, when she turns her blog over to her readers to share their Christmas TV memories. This year, the topic is animation, and Joanna has graciously given me some space to talk about the classic Rankin-Bass special The Little Drummer Boy. Joanna also had some kind things to say about the blog, which I reciprocate in kind - if you love Christmas and you love TV (in that order), you should make her blog a regular part of your schedule. And while you're at it, Joanna has also written some terrific books on Christmas TV shows; they should definitely be on my bookshelf, and yours as well.